#87 "Iron Gods #3 - The Choking Tower"
The Lords of Rust and their strange Iron God have been defeated, but in doing so, Numeria's newest heroes uncovered a greater threat to the land than that posed by a gang of bandits. Another, more powerful Iron God is rising in power in the enigmatic Silver Mount, but before it can be confronted, the legacy of this strange deity's first worshiper must be recovered. Clues lead to the technophobic town of Iadenveigh, a farming community with its own need for heroes. What role could the mysterious Smoke Wizard of the Choking Tower play in this unfolding threat? Can the heroes prepare for their inevitable confrontation with Numeria's Iron God in time? 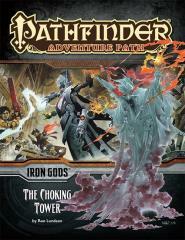 "The Choking Tower" is a Pathfinder Roleplaying Game adventure for 7th-level characters. The adventure continues the Iron Gods Adventure Path, an exploration of the lands of Numeria, where savage barbarism clashes with the wonders and horrors of superscience. Several new monsters, a gazetteer of the town of Iadenveigh, several bonus encounters set in Numeria, and Amber E. Scott's Pathfinder Journal round out this volume of the Pathfinder Adventure Path!